We have various different ways for producing banners, from digitally printed versions, to off-the-roll versions for quick and cheaper banners. Our banners have eyelets to secure them. 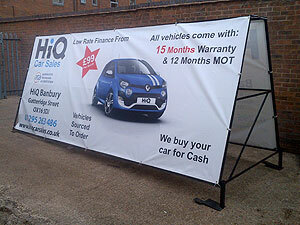 These banners are great for budget or reusable banners if you dont want the expense of a digitally printed banner. There are 3 heights, and 6 colours of backing, and then 18 colours for the text and graphics required. This range of vinyls also has RAL codes if we need to match your colours.